Dinner tonight for FACP governors and delegates will be hosted in the CCP by its founder, former first lady Imelda Marcos. The Taipei Symphony Orchestra under Hubert Soudant performs after in the Main Theater with Ray Chen violinist and Raul Sunico pianist as soloists. Former Philippine First Lady Imelda Marcos to host the closing dinner of the 29th FACP Conference in Manila in the Cultural Center of the Philippines, which she built in 1969. The dinner will be on November 4, 2011 prior to the performance of the Taipei Symphony Orchestra under Hubert Soudant. 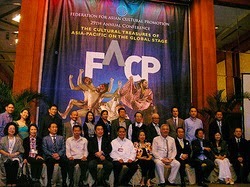 Philippine Department of Tourism to host the opening dinner of the FACP Conference in Manila in the historic walled city of Intramuros on November 2, 2011.